Jackie Stewart put his disappointment at Spa - where he led until running out of fuel on the last lap - to win the Dutch Grand Prix despite being handicapped by having his right arm encased in a plastic cast following a Formula Two crash two months earlier. It was the first win for a French car in a grand prix since 1952. The race took place in dreadful conditions - The Guardian reported few grands prix had taken place in worse - and Jochen Rindt edged into the lead as a number of cars spun at the start. As Rindt fell back with ignition trouble Graham Hill briefly headed the field before Stewart overtook him on the fourth lap. As conditions worsened, the second Matra of Jean-Pierre Beltoise moved past the two Ferraris and started challenging Hill, passing him on the 11th lap. A spin onto the beach hampered the progress of Beltoise and he was forced to stop at the pits to have the throttle slides cleaned of sand. Despite that, and aided by retirements, he made up the lost ground and again overtook Hill, and soon after Hill spun to allow Pedro Rodriguez into third. Although he got his Lotus going, he then span again, this time wrapping his car into fencing to end his afternoon. 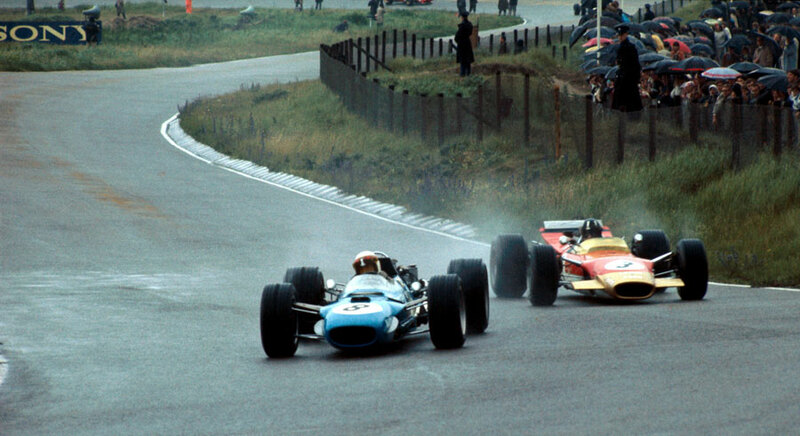 Stewart, who finished a minute-and-a-half clear of Beltoise, had at one point lapped the whole field, the first time anyone had achieved that at Zandvoort. "I'm so pleased to have given Matra their first win," he said. "I don't mind putting up with the discomfort of my hand to do this." Asked about the wrist, which had been so painful he missed the Saturday practice, he said: "I was doubtful about starting and the right wrist, which I use to change gears, was darned painful. I'm afraid I haven't done it much good."